June 3: Otho Strahl was born in Morgan County, OH to Philip and Rhoda Strahl. July 26: The U. S. Federal Census enumerated in Malta Township, Morgan County, OH showed Strahl living with his parents and three younger siblings. His father, Philip, was a farmer. Otho F. Strahl was listed in the Ohio Wesleyan University school catalog as a sophomore from McConnelsville, OH. February 23: Strahl attended The Opposition State Convention held in Nashville, TN. Tod Carter was also at this meeting as a delegate. June 18: The U. S. Federal Census enumerated in Dyer County, TN showed Strahl, a lawyer, living in the household of R. H. McGaughey. McGaughey owned 6 slaves according to the 1860 Slave Schedule. July 10: Public Ledger, Philadelphia, Pennsylvania. Strahl served as Mayor of Dyersburg, TN. May 15: Strahl entered the 3rd TN Infantry as Captain in Germantown, TN, where he was elected to the rank of Colonel two days later. 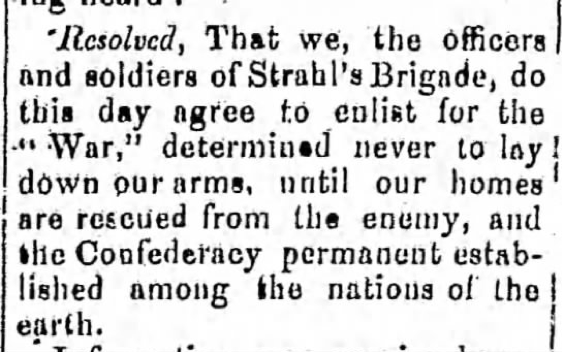 August 17: Strahl entered the 4th TN Infantry. August 10: Alexandria Gazette, Alexandria, VA. Strahl is promoted. February 5: Alabama Beacon, Greensboro, AL. Strahl’s Brigade reenlisted. November 30: Strahl reloaded his soldiers weapons for over two hours before he was killed at the Battle of Franklin. His body was later moved to the back porch at Carnton. He was buried at St. John’s Episcopal Church south of Columbia, TN for nearly 30 years. His body was exhumed, and his final resting place is the Dyersburg City Cemetery in Dyer County, TN.